A FRUIT is defined as “a ripened ovary containing seeds.” Some “fruits” depart slightly from that definition. 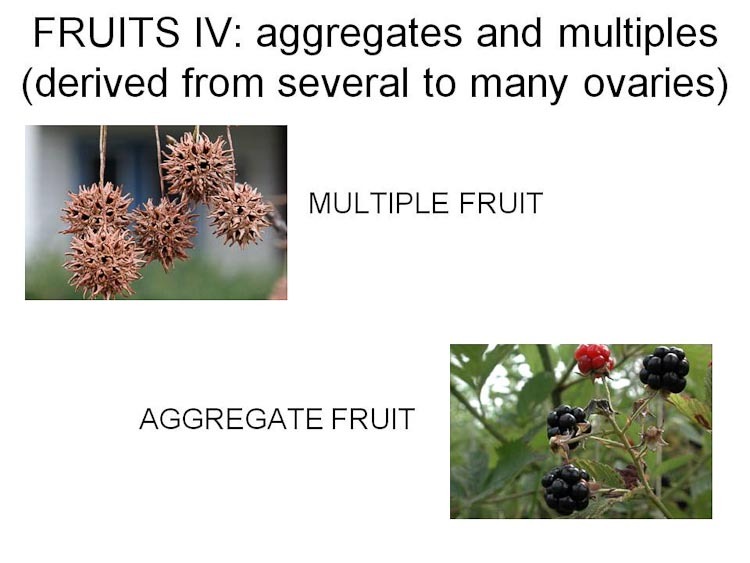 A large tight cluster of many individually small fruits may be presented or dispersed as a unit, thus it isn’t “a” ripened ovary, but many of them. 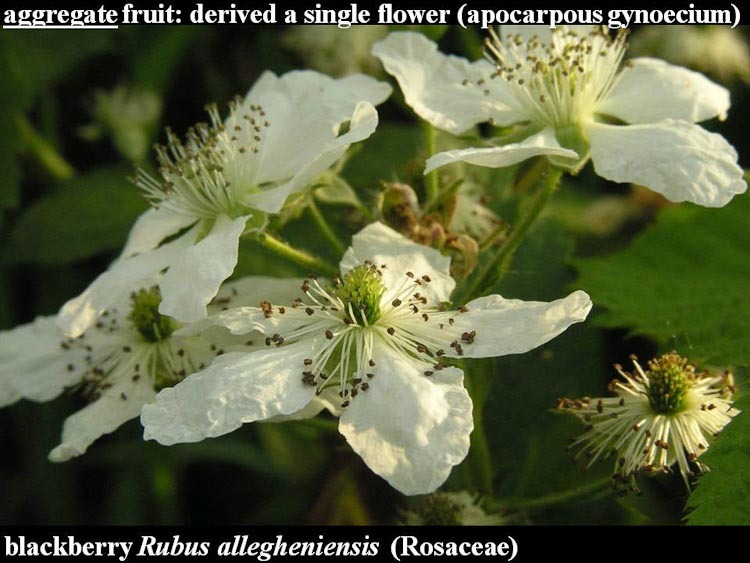 AGGREGATE FRUITS are clusters of small fruits derived from the separate carpels of a single (apocarpous) flower, whereas the individual little fruits on a MULTIPLE FRUIT can be traced back to separate flowers themselves tightly bunched in a head-like flower cluster (“capitulum” inflorescence type). 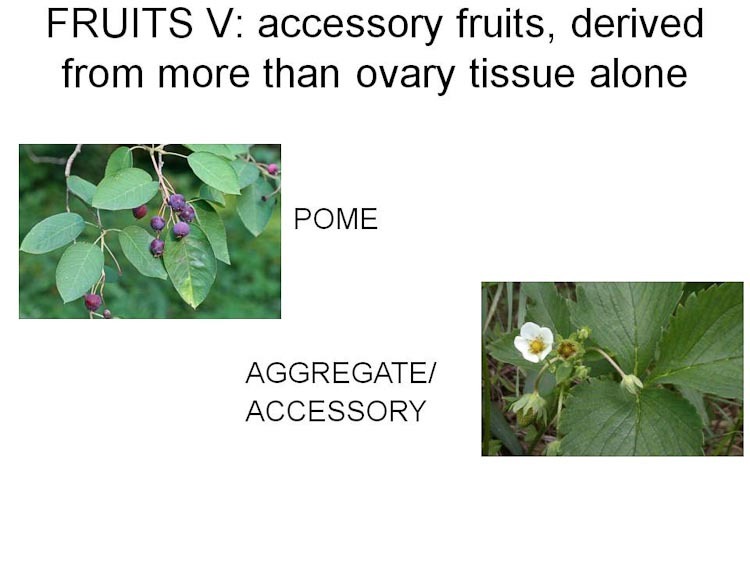 These two multi-ovary fruit types can appear nearly identical in form, as a raspberry (aggregate) resembles a mulberry (multiple). 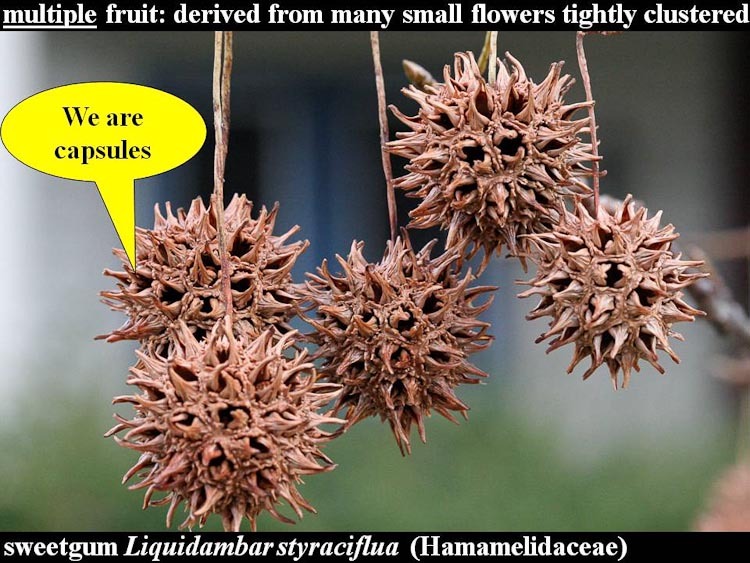 Since aggregate fruits and multiple fruits are clusters of some other fruits, it isn’t enough to say simply that something is an aggregate fruit or a multiple fruit; you have to actually say what fruitlets it is an aggregate or multiple of. Below, tremble in amazement at raspberry. Pry off one of those tiny round globes and point the Enlargo-Ray at it, and (ta-dah!) you have a cherry. Give it other blast and it’s more like a plum. 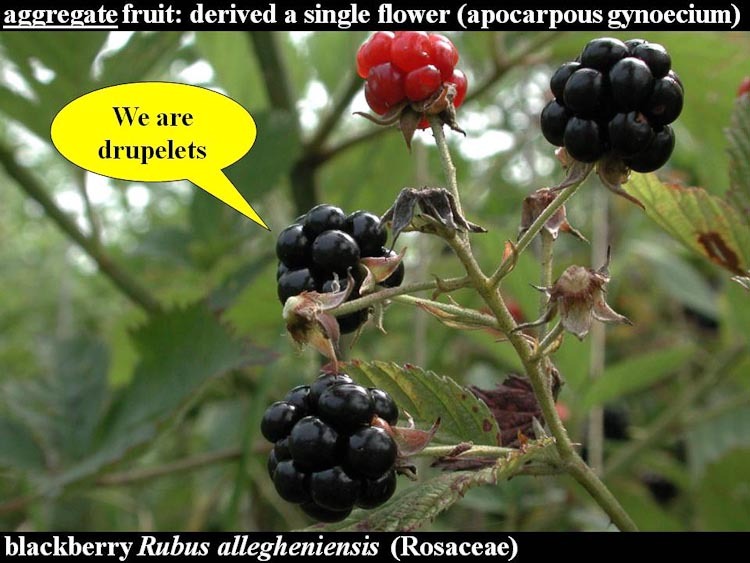 The raspberry is an aggregate of “drupelets” (little drupes). Below, sweetgum in all its magnificence. This delightful tree is a southeastern lowland species that is native to Ohio, but just barely so. It does very well as a street tree, however, hence it is planted a lot. 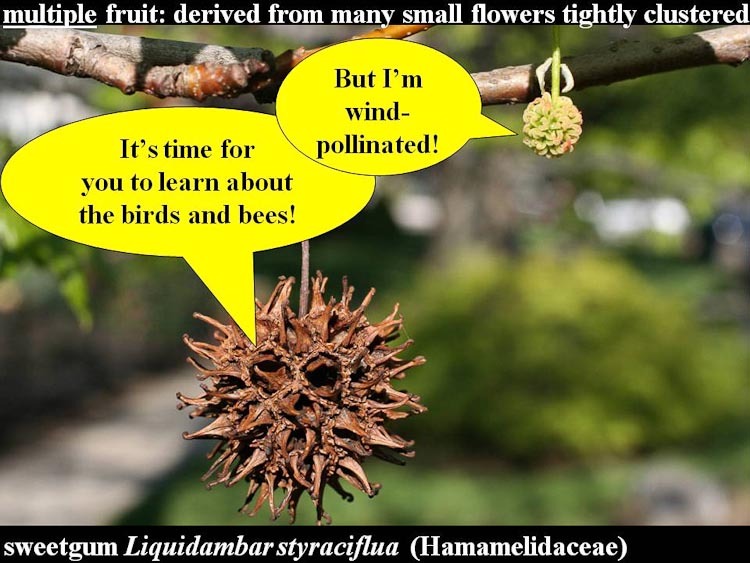 Sweetgum produces inch-wide spiny balls that fall to the ground specifically to annoy people. Do not dance barefoot beneath a sweetgum tree. Another way for a “fruit” to depart slightly from the textbook definition –“a ripened ovary containing seeds” –is for some organ other than the ovary to get involved. These so-called ACCESSORY FRUITS (sometimes called “FALSE FRUITS”) are not very common, but two of them are very well known. Below, shadbush. This early-flowering tree is also called “service-berry” because, in colonial times when there was a death during winter with the ground too frozen to perform a burial, the affair was postponed until spring, when these trees were in bloom (hopefully cheering things up a bit). The fruit is a POME, same as an apple or pear (or quince). 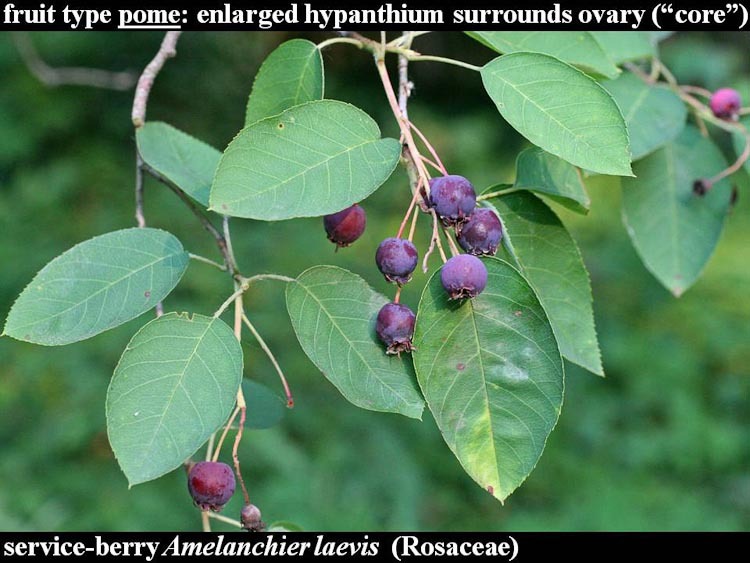 A pome is the characteristic fruit just of one subfamily (Pomoidea) of the rose family (Rosaceae). It is derived from an inferior ovary (hence the accurate distinction between the “stem end” and the “blossom end” of an apple) which can be seen as the “core” deep inside all the delicious fleshiness. 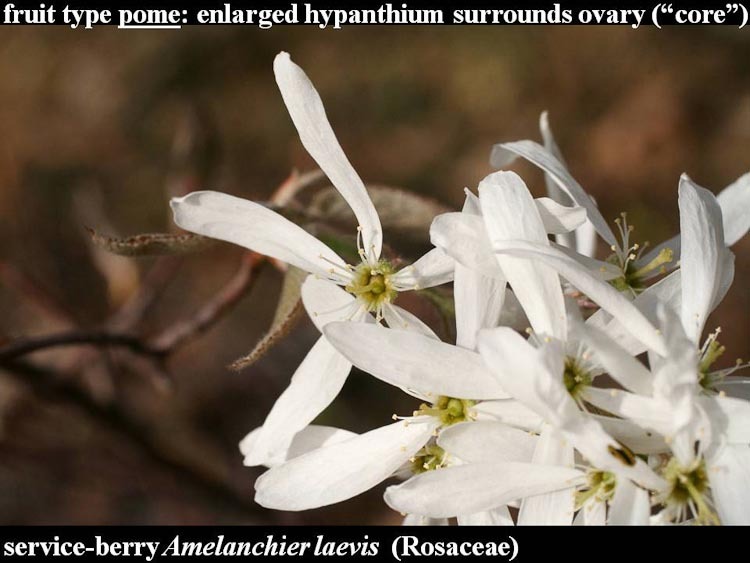 The fleshy part of the pome is the hypanthium. SLIDE the image to see service-berry in flower. The service-berry fruit is an apple-like pome. Below, the most peculiar “fruit,” the strawberry. 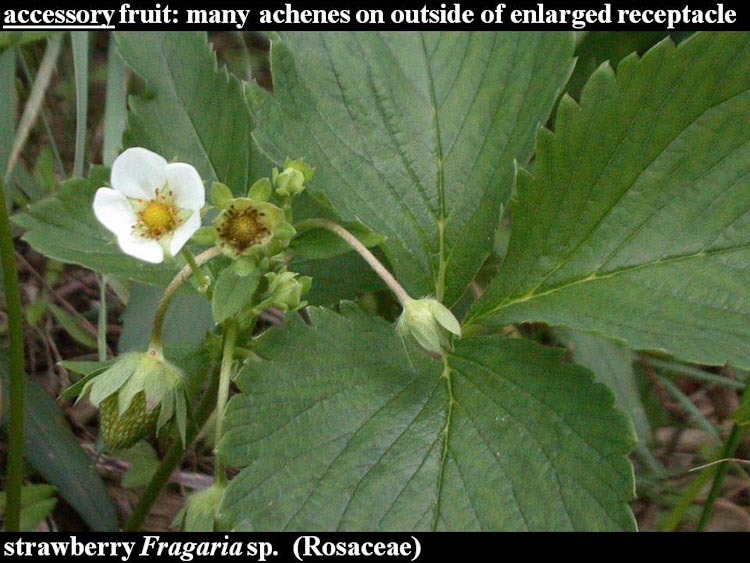 Found only in two genera in the rose family (Fragaria and Duchesnia), Mr. Strawberry turns the notion of a fruit inside-out! The strawberry flower is a typical rose family bloom, essentially what you see in cinquefoils (Potentilla), avens (Geum) and raspberry (Rubus, near the top of this page): regular symmetry, separate flower parts (except for a small hypanthium), and most importantly, an apocarpous gynoecium with many spirally inserted carpels sitting on a thimble-shaped base called the receptacle. 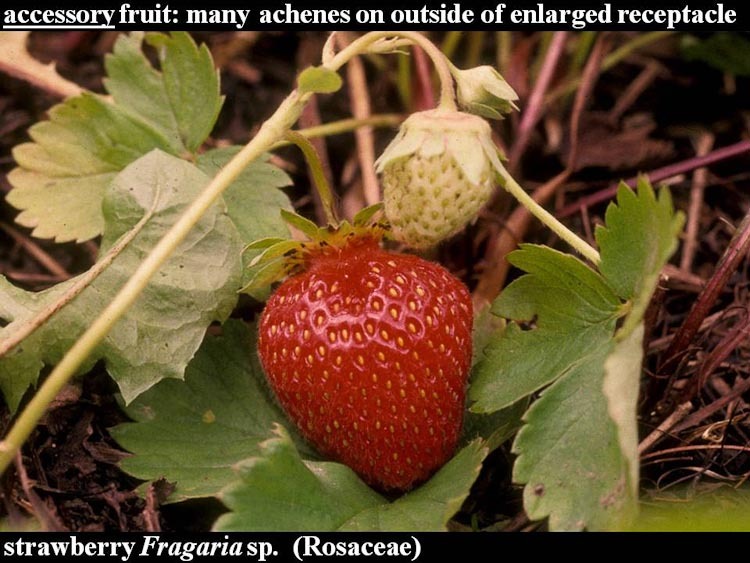 When the strawberry progresses into the fruiting stage, the receptacle becomes swollen and fleshy while the actual fruits, single-seeded ACHENES, remain attached, sunken into small pits on the surface of the receptacle. SLIDE the image to see strawberry in flower. The strawberry is an accessory fruit.